Some find them cute, some get totally freaked out! But they all look cute in some way, don’t they? 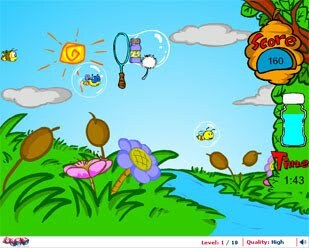 Bubble Bugs is a fun game, in which you catch flying bugs in little bubbles. Catch two of them together in one bubble for more points. Also, don’t forget to catch little soap-water bottles to refill your stock, and clocks to increase your time!